A little while ago, Veles wrote an article about the Shadow Era card Antimatter and how it has gone from mediocre in Dark Prophecies to excellent in Shattered Fates. The same can be said about the card Spirit Warden, except it was mediocre and is now excellent for very different reasons. Antimatter got better because of other cards that became available to elementals, while Spirit Warden became better because of cards available to everyone else. So what does Spirit warden do exactly? It has three abilities all rolled into one. First it has steadfast. Steadfast says that the card cannot leave play unless it is killed. This essentially protects from bounce effects, like Retreat! but also exiling effects that don’t require killing, like Loest’s ability. It also has a passive ability that prevents opposing heroes from returning allies from their graveyard to their hand, the most notable example would be Shadow Knight, who’s ability fizzles when Spirit Warden is in play. Lastly, it can exile allies from graveyards. At first these abilities seem to have nothing to do with eachother. After some thought, though they all seem to have a flavor of an ally that is anchored to this realm and exerts some control over the spirit realm. It’s an interesting card, but it was mediocre in Dark Prophecies. Why? Well in Dark Prophecies there really weren’t many cards that made Spirit Warden worth playing. It was a way to interrupt a Shadow Knight Loop, stop Honored Dead, and starve Death Collector and Gravebone. Additionally, Steadfast served as a counter to Retreat!, Darkwood Wraith, Banish and Snare Trap, which were rarely used cards anyhow. It could also be used to lessen the potential impact of Infinity Core, Soul Reaper and Eternal Renewal. Essentially those were all the possible uses for it and very few people used it except as a 2/5 ally (as there were relatively few allies with those stats). The fact is that its uses as tech were limited and largely unnecessary. So what has changed? Spirit Warden is now seeing a good amount of play across various human decks. There are many potential reasons. First, new cards like Loest, Bloodpack Shaman and Road Less Traveled have given a few more potential uses for it. Additionally, several other cards have changed the meta in subtle ways that make it much more useful. Most notable of these are Bloodpack Shamans, which can be very troublesome if allowed to loop indefinitely, especially in decks that rely on combat damage or have no access to mass ally removal. Spirit Wardens give a hard counter to these that is capable of exiling them for good, stopping their recursion, and killing them when they’re cast. Loest came about in the middle of Dark Prophecies, but hasn’t become a major threat until more recently, particularly with the changes to Amulet of Conjuring. Because Loest has become stronger, he requires stronger counters. Spirit Warden represents an ally with high health who can’t be exiled by Loest. That by itself is nice, but what about Supernova? Well that’s what Midnight Sentinels are for! The interaction of these new cards (Amulet making Loest stronger and Sentinel making Warden stronger against Loest) has resulted in Spirit Warden becoming very useful tech in the current meta. Some people prefer Knight of Unaxio for this purpose, but I’m a fan of the cheap allies, and Spirit Warden does the job just fine. Undead are another thing that has massively changed and made Spirit Warden much more useful. First, Grave Resistance has made all Undead decks much better than they were (indeed Undead themed decks weren’t really a thing before). Specifically, Death Collector was always a mediocre card, and now is fairly strong. Shadow Knight loops were always a threat, but they are more prevalent now that undead, as a tribe are so much stronger. 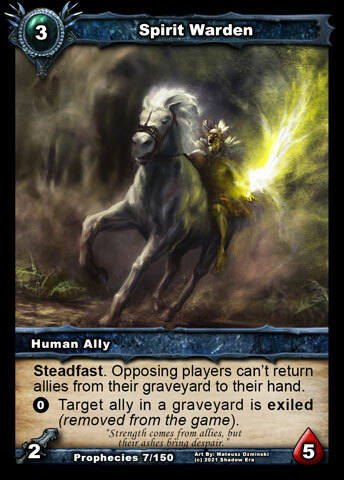 Additionally, many new undead cards have prerequisite numbers of allies in the graveyard before their abilities activate. These numbers are easy to achieve, so any help with thinning the graveyard can greatly reduce the threat posed by allies like Cryptspawn Tormentor. Along these lines, cards like Dakrath in Gravebone decks have made it extra beneficial to be able to exile the cards in the graveyard. This has been magnified by cards like Falseblood Cultist, who feed that graveyard so Gravebone can play Dakraths without even needing to cast them first. This buff has made Spirit Warden more useful as a potential counter. Hunter’s Gambit has also affected Spirit Warden…What? How? Well it has made Victor and Banebow much more competitive, which means that we are seeing a lot of Snare Traps in the current meta (particularly in Victor decks). Similarly, Baduruu has become much more competitive with Gambit and Emore Crossbow. Spirit Warden is a solid counter to snare traps, due to that steadfast. Spirit Warden comes into play, Snare Trap triggers because it has 3cc, and tries to exile Spirit Warden, Steadfast protects Spirit Warden, and the Snare Trap just exiles itself. This can give some nice card advantage against hunters. A new archetype has become much more prevalent with twilight allies and homunculi. I’m talking about tower decks. Those Aramia and Gravebone decks that create several tower allies very quickly have presented problems for many heroes. What does this have to do with Spirit Warden? Well not a whole lot, except that a strong counter to tower allies is Retreat! Retreat also counters A Legend Rises, which has become a common response to attachment heavy decks like Vess. Retreat is now crucial for warriors, who control allies with attachments and can lose a game to a well-played A Legend Rises. Similarly, Road Less Traveled doubles as a draw engine, and a desparate form of removal. Bouncing has come back into fashion and is much more common, especially among warriors. Spirit Warden’s steadfast provides a simple counter to bouncing, and makes it the perfect target for A Legend Rises, particularly against warriors. Furthermore, cards like Rampant Krygon have made it very important to have low cost, high health allies in decks that hope to compete with shadow for the early game, but don’t have shadow abilities that help in this regard. For example, Zaladar, with Rampant Krygon can easily kill a 3/4 ally and still be able to attack your hero. With a 2/5, that Krygon would need to attack the Spirit Warden, saving your hero 2 damage. That doesn’t seem like a lot, but 2 health vs Zaladar can make a big difference. So as you can see, a series of changes in the game have created a situation where a previously niche piece of tech has become generally useful. Whereas Spirit Warden in DP was perhaps useful in 1/20 games, it is now potentially useful for one of its abilities in roughly 1/2 of games. Spirit Warden has not gotten better, the meta-game has just changed to make him generally useful. Tagged dark prophecies, hidden potential, Shadow era, shattered fates, spirit warden. Reading this stuff makes Shadow Era immensely enjoyable for me – thanks for posting!